Stubbornness Cost Me Four Months of Running. What's It Costing You? So let’s see…ignored it for three and half months…I’m now two and a half months into rehab…Ugh. I haven’t run since October and it’s eating at me. But what can I do now? It’s counterproductive to gripe and feel down about my situation. I can only diligently complete the strengthening exercises each day and rest. Given the stakes (completion of the marathon), I should have been at the podiatrist a week after this happened. But what I did is so human nature. I tried to explain or justify an action (continuing to run) based on a contrived logical (to me) reason (it’s not that bad and I’m afraid the doctor will tell me to stop running). Had I sought help promptly, the treatment would have started much sooner. Most likely, I would have been able to complete the marathon anyway and the recovery time would have been quicker. My “what-I-don’t-know-won’t-hurt-me” philosophy will end up costing me at least four months of running. Tomorrow only came when I admitted my inability to care for myself and sought help. Yes, it was humbling, even a little embarrassing to tell the doctor I had ignored it for so long. He was gracious. I felt stupid. The bad situation is improving, now that I’m following his guidance. I’m about 85% healthy and feeling improvement every day. With luck I’ll be running by mid-March. That would never have been possible though if I’d let the bad situation heal itself. In a perfect world, the one cortisone shot I received would have healed the damage to my tendon. Obviously it didn’t, so I’ve been forced to develop a whole lot of the one virtue so difficult to cultivate – patience. The bad situation doesn’t improve itself without help and it doesn’t change overnight. It takes time to work our way out of the doom and gloom to feel the sun shining on our face again. When we are in “that moment” we don’t want to hear “Be patient.” We want a quick fix now and a Matrix blue pill to make all our troubles go away. It doesn’t work that way. When you’ve dug a hole, the best thing is to begin patiently climbing. Your situation may be quite extraordinary, much more devastating in its impact than my strain of a simple foot tendon. I hope my experience compels you to take action and seek help for whatever ails you. No amount of rationalization, ignorance, pride or denial will make “that thing” go away. Let go of your stubbornness, find help and let the healing begin. What holds you back from seeking help? Why is it so easy to rationalize our actions? Has your stubbornness put you in a difficult situation before? Have you ever turned stubbornness into a positive? I’ve become much better about going to the Doctor for issues, mainly because since having two sinus surgeries and starting allergy shots I’m realizing that some things can be avoided if you attack them right away (like 5 years ago…) instead of ignoring them. I can relate to you in a smaller way as I hurt my ankle and hip training for a half marathon, but I was so close to the race that I ran it anyway. I didn’t run for another 2 months after that as my body healed, and I certainly had no business running that race. It’s funny how easy it is to rationalize things in our head! It’s funny and costly…but we’ve become masters at rationalizing. You’d think we’d learn from our mistakes quicker than we do. Love the lesson here. This cold weather cost me a good deal of the progress I had made with my running. But in terms of finances, definitely more money than I would like to admit. I’ve always been one of those “I’ll get around to it tomorrow” people, until I realized that there were actually people and companies who did get around to things, and it was costing me. The “I’ll get around to it” philosophy is deadly. What if tomorrow never comes? Better to go after it today because we don’t know how long we are given. Have you ever read “Born to Run”? Having read that I feel so wimpy about stopping for my running pain. I have not picked that up yet, although I know it’s the classic for the sport. Should probably put that on my reading list. OH man can I TOTALLY relate to this post right now. While its not my foot, it’s my calf, which hurt during the half marathon and of course hurt worse after. I still haven’t gone to the doctor, but I still think it’s a bit too soon and want to give it more time with ice, heat, foam rolling, etc. Have I stayed off it completely? Uh, no. 🙂 But I haven’t run either and I’m CRAVING my beach runs so bad!!! And quite honestly if they told me I needed PT I wouldn’t go anyway because it’s out of my budget, and quite frankly, in some ways (IMHO) not the best use of my time or money. I have to be honest, the more and more I hear stories, the more I wonder why I even bothered doing this challenge. It seems everyone has gotten hurt training and running long runs. I guess right now I’m just feeling a bit cynical about it. lol! Yes…running does bring injuries…mine I think was simply from overuse, which I tend to cut back on when I resume. Deep down though, you’ll admit the challenge was a positive experience that taught you some things about yourself, right? Yikes!! 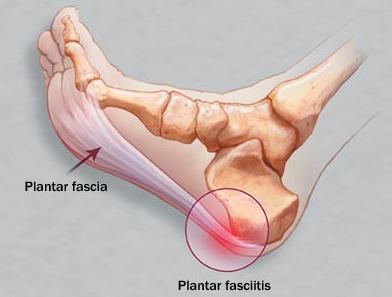 My mom had plantar fasciitis before and I remember how painful it was for her. I hope you’re on the mend soon. Like you, I tend to get stubborn about doctor visits (and other head-in-the-sand situations) and that can lead to some nasty repercussions. Thanks for the reminder to be proactive! Mine was painful enough to keep me from running but not painful enough to walk around during the day (although it still was uncomfortable). I guess it’s easy to get stubborn about doctor’s visits when half the time you go they say something like, “Well, your cold is just going to have to pass on it’s own.” Gee…thanks…I could have figured that out by myself…here’s $100 for your time. Probably several thousands over the year, and a lot of productive time doing menial tasks because “I can do it” instead of outsourcing and doing what I am really good at. I love to do things myself so outsourcing is really hard. Things feel out of my control and I don’t like that. I agree though we lose a lot of productivity trying to accomplish tasks we aren’t really good at and we would be better off paying someone with the skill to do the work for us. I’ve learned that the hard way many times. My wife had the exact same thing 4-5 years ago and was before she started running again, but still let it go too long. I think you’re spot on Brian – especially with #2. I’m definitely guilty of thinking that things will just take care of themselves and all will be good. Maybe that’s true .00001% of the time, but it generally isn’t. For me, I think the rationalization goes back to me foolishly thinking that whatever it is will return back to normal on its own or that I can solve it. For some odd reason, I seem to like to learn things the hard way. I get sucked into that way of thinking partly because my personality wants to avoid conflict. So I don’t confront the issue, hoping it will take care of itself. It never does…only gets worse. The good thing is I’ve learned to recognize the mental cues that come when I’m about to do this and have pushed myself more to solve issues when they arise. However, not in this particular case…so I guess I’m still a work in progress. I can be really stubborn, and you’re very right that it can be costly. My boyfriend is guilty of this, too, especially when it comes to being sick or feeling a bit “off.” My parents are the same way, which worries me since they’re older. It can be really scary to receive a diagnosis though, and some people would rather bury their head in the sand (which is how some deal with debt!). “…(which is how some deal with debt! ).” I’m glad you picked up on that E.M. and made the link to stubbornness with finances. There are so many applications this concept applies to when it comes to our money. I think it could be man thing. You know how we don’t ask direction, well nowadays, we have iPhone, but before the smart phone days, I remember just going off miles and miles wasting gas and finally resorting to asking for direction at a gas station. You are absolutely right Brian, stubbornness is costly. “Holes take time to climb out of”. This has been profoundly true for us, Brian, and our debt situation. Our stubbornness came in the form of the “I wants”, and it was that stubbornness that caused our debt problem – that inability to step back and assess what was best as opposed to what we “wanted”. Great post!! Heal up soon, my friend! When you are in the midst of the trouble it’s difficult to step back and evaluate what’s best. If we can’t do that, we are likely will put ourselves into even more trouble.